The program is still offered as a portable version and installer, in a tiny 300 Kilobyte package. When you first launch the app after unpacking or installing, you are asked whether you'd like to enable automatic updates. 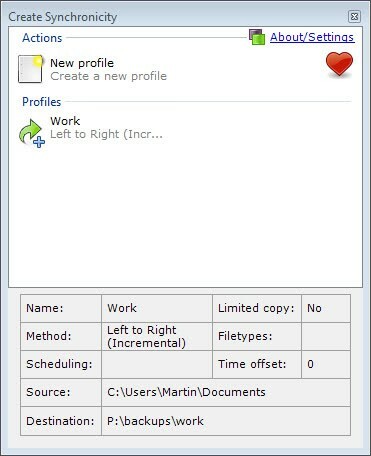 The program then starts the profile listing where you see all synchronization and backup profiles that you have previously created, and a button to create new profiles. (Hidden setting) Customizable delay between queued profiles. Send logs by e-mail (see "scripts/mail.bat /?" for more info). (Hidden setting) Forget (discard) files older than a custom number of days. (Hidden setting) Exclude hidden files. Command-line switch to sync all profiles (/all). (Expert setting) Estimate remaining time (experimental). (Expert setting) Show diff for modified files. (Expert setting) Compare file size in addition to last modified date. Localized installer, in most of the supported languages. Add a setting to catch up missed backups (when a scheduled backup has been repeatedly missed, forces its immediate execution). Will give this a test. My present file backup software I’ve been using for 7+ years is Karen’s Replicator (http://www.karenware.com/powertools/ptreplicator.asp).